Italian yard ISA Yachts used the occasion of the Fort Lauderdale International Boat Show 2017 to announce that it has taken an order for a 50 metre new-build motor yacht project with delivery scheduled for 2020. 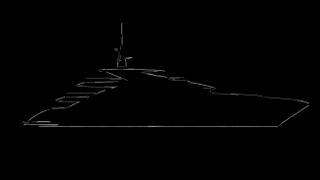 Built from a steel hull and an aluminium superstructure, the new yacht will be the 12th hull to be based on the yard’s 47-50 metre platform and will comprise a total interior volume of 499GT. As the teaser image above reveals, this yacht will boast a key ISA design feature in the form of grand arches that connect the cockpit to the superstructure, balancing elegance with sportiness. To this end, the as-yet-unnamed tri-deck yacht will be capable of a top speed of 15 knots and a transatlantic range when trimmed back to cruising speed. This is the third yacht that ISA has sold in the past two months, following on from the Alloy 43 and the 65 metre Project Rocco. No further details of the 50 metre ISA project will be released before next year, but it is likely that construction will take place at the yard’s Ancona headquarters. Other superyacht projects currently taking shape on this site include the 80 metre Columbus Classic yacht, which is due for delivery in 2018.